One of the busiest sports days of the year provided plenty of local excitement. The Redbirds opened the scoring on a J.T. Bohlken field goal from 27 yards just 2:28 into the game, but the host Panthers nailed four field goals followed by a pick-six to take a 19-3 lead with just over three minutes before halftime and never looked back. Spencer Schnell caught an 11-yard touchdown pass from Jake Kolbe for the Redbirds’ first touchdown with 7:49 left in the game, and Kolbe found Braxton Haley with a 38-yard strike with 3:43 left to cut the margin to 26-16. Kolbe was 21-of-27 through the air for 180 yards with two touchdowns and two interceptions. Records of both teams moved to 5-4. Illinois State visits Indiana State next Saturday. The battle for the College Conference of Illinois and Wisconsin lead was a punch-counterpunch affair for the first half with the host Titans scoring on a one-yard keeper by Brandon Bauer and a 24-yard pass from Bauer to Dean Zigulich. North Central took a 21-14 lead on a 94-yard kickoff return by Cameron Moore after the second IWU touchdown, and that remained the score at halftime. Touchdowns early in the third and fourth quarters plus a field goal in the final period allowed North Central (8-1) to pull away. Jack Healy caught a 25-yard TD pass with 1:01 left for the final tally for Illinois Wesleyan (7-2). Bauer was 37-of-57 for IWU for 367 yards with two touchdowns and two interceptions. Morgan Alexander rushed 26 times for 82 yards. NCC and IWU are now tied at the top of the CCIW standings at 6-1. IWU travels to North Park next Saturday afternoon. Tri-Valley (7-4) earned a second straight upset by knocking off Pana. The Vikings took a 21-12 lead into halftime in the back-and-forth contest and kept a 35-25 lead after three quarters. 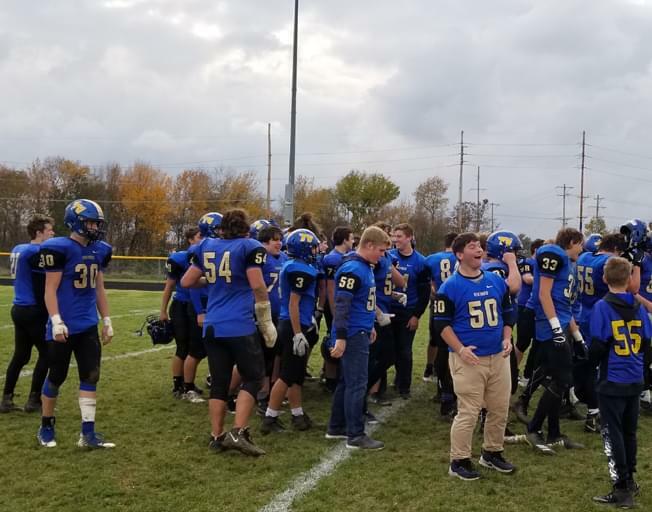 Zach Woodring led the Vikings with 154 yards on 27 carries while quarterback Jake Reeser scored five touchdowns, one passing and four rushing. Tri-Valley visits Decatur St. Teresa in the Class 2A quarterfinals next weekend with date and time to be determined. Eureka captured the Girls Class 1A team title as Hornet Emma Argo won the individual championship. In Boys Class 1A, Olympia finished fourth followed by El Paso-Gridley seventh and Eureka 10th. In Class 2A, Bloomington boys placed third, led by Nick Doud and his individual fifth-place finish. Charlie Wetzel of Normal West placed seventh individually in Class 3A. Illinois State took an 82-74 win over Division III power Augustana in the final preseason exhibition at Redbird Arena. Phil Fayne led the Redbirds with 23 points, supported by 17 from Zach Copeland and 16 from Malik Yarbrough. The Redbirds open the season at home on Tuesday against Florida Gulf Coast.